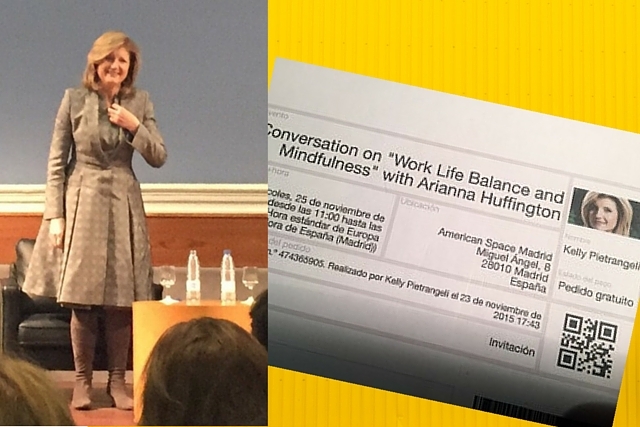 I recently had the pleasure of attending an inspirational talk in Madrid by Arianna Huffington, founder of The Huffington Post and author of the wonderful book ‘Thrive’. The subject of her talk was one very close to my heart: Balance & Mindfulness. When she asked if anyone had any questions, my hand shot up. Before I knew what was happening, a microphone was thrust into my hand and I was told to stand up and introduce myself. They go to bed feeling exhausted and guilty for everything they haven’t managed to get done. Arianna, what would you say to the mother with the never-ending to-do list? There’s always going to be your to-do list. But you also need a gratitude list. Every single day, write at least three things you’re feeling grateful for. The more gratitude you have for all of the people and things you have in your life, the more grace you’ll extend yourself for not ‘getting it all done’. Focus on what you achieved each night before bed, not on what you didn’t manage to do. Of course, this made my heart sing, and if you’ve been following Project Me for any length of time you’ll know that I’m always banging on about gratitude as a daily practice. There’s even a place to write gratitude at the top of my Design My Day action sheet. Never leave that box blank to just focus on your to-dos. We feel guilty as women because we find it hard to balance our needs with everyone else’s, but we need to educate this inner voice. It’s never going to be perfect. It’s about learning to dance with it, moving from struggle to grace. Don’t judge yourself if you’re not doing what you’re supposed to do. Take small steps toward your goals. Model a baby who is learning to walk. If babies reacted like adults when they fail, they would give up and never walk. When mothers give birth, the baby comes out, and the guilt goes in! We need to honour what we want, not what others or culture expect from us. Arianna shared a powerful story of when she literally crashed and burned-out eight years ago and encouraged us to learn from her mistakes. She pointed out that we all know how much battery power we have left on our phones. When we fall to around 20% we start to get twitchy and look for a way to charge it back up again. But how many of us pay the same attention to our own energy levels? Do we notice when we’re running on low? Do we stop and do something to recharge ourselves? Many of us are running on dangerously low levels and don’t realise that there’s not an infinite supply. We will burn out if we’re not careful. Sleep is the number one way to recharge your battery. We all need varying amounts of sleep to wake up feeling 100% and that ranges between 7-9 hours of sleep. There is a rare 1% of people who can honestly get by with less than that. It’s important to pay attention to what your ideal number of hours of sleep are per night. For Arianna, it’s eight and a half hours. For me, it’s eight. If I get to sleep eight hours before I need to get up, I wake up naturally and feel my 100% physical and mental best. If I get seven hours, I’m operating slightly substandard and I can feel it. Six hours, I’m fuzzy-headed, unfocused, lethargic and irritable. You don’t even want to know what I’m like when I get less than six hours. But I’ll tell you anyway. The voice in my head goes negative towards myself and others. I completely lack motivation. I feel down and I take it out on those I love the most. If you’ve got a child who still wakes in the night, you have my sympathy. Sleep deprivation is an evil thing. It clouds your thinking, affects your mood and makes you behave irrationally. It wasn’t until I began getting full nights of uninterrupted sleep that I began to feel human again. But what about self-inflicted sleep deprivation? Staying up too late even though you know you have to be up early. Many of the women in my programmes are now past the baby and toddler stage, yet they’re getting to bed too late out of habit. They’re depriving themselves of the deep benefits that come from getting enough sleep. Arianna’s now so devoted to good sleep that her next book is dedicated to it. Experiment with sleep times until you know how many hours of sleep you need. Determine what time you will need to turn the lights out based on what time you need to be up the next morning. Thirty minutes before lights-out, set an alarm as your ‘shutting down time’. No computers, phones or TV allowed. So busy women, take a lesson from Arianna and take care of yourself. Put your own oxygen mask on first. It’s not selfish, it’s essential if you’re going to continue to give your best energy to your family. It’s the key to being the best version of you. Are you up for a challenge? How about setting an evening alarm every weeknight for when you’ll shut down all electronics and get ready for bed? In the comments below, tell me if you’ll give it a try. Or share how many hours of sleep YOU need to feel 100% the next day. Craving a happier balance in life? Use the Project Me Life Wheel® once a month to do a quick audit of the 8 Key Areas of your life. Simply put your first name and email into the box below. Then check your inbox for your Life Wheel Tool. It’s my free gift to you. It is so great that you were able to speak to Arianna Huffington! I read her book and it inspired me to start seeking a better work life balance. It was seeking this that brought me to Project Me, so it kind of feels full circle now! I love how you both write about the importance of taking care of yourself. I was close to burn out and wasn’t even seeing it. Now I get to bed early, wake up and meditate and give more attention to my diet. I’m a much better mum because of it. Thank you Kelly and Arianna for the inspiration. Sophie, so many of the women I work with say the same thing. Their sleep deprivation is no longer caused by their kids. It’s self-inflicted! Old habits die hard, so you’ll need to set that bedtime alarm and use your willpower to stick with it and create a new, healthier habit. Got my alarm set on my iPhone now! I work a lot at night since I have 4 kids ages 9 and under. But then I keep going and going and get to bed way too late. Thanks for the challenge, Kelly! I hear you on the going and going and going….. it’s always ‘just one more thing and THEN I’ll shut down…’, right? That’s how it is for me anyway! My sleep pattern is something i have been trying to work on for a while but with a 2 1/2 year old and a 15 month old sleep deprivation is still an issue. Last night my darling children went to bed at 7:45 and both woke at 11pm full of energy. I already know they need to go down around 8ish even when waking at 7:30am but I’m not sure of MY pattern. So this week I will be recording my sleep and wake times and keeping a record of the day and my emotions…hopefully I will find my pattern. I have used SleepCycle for 2 years now, but despite knowing my score (as a % of sleep quality) somehow it has not helped me manage my sleep better. Last night I had a 63% score – I was on Amazon – the night before that I had a 41% score – my youngest was ill in the night. I know I should have gone to bed earlier, I could have recovered and got 100%… so Kelly, I accept your challenge and will put an alarm on my phone from now on for 10pm! It’s interesting that you’ve used this app for two years, but your scores aren’t actually inspiring you to make any changes or take action. It’s almost like an interesting stat, but nothing more. I believe the key for you is to create some kind of consistent routine / bedtime ritual and by that I mean a RULE for yourself, such as NO electronics / TV after a specific time. In order to drop a bad habit, you need to replace it with something pleasurable and satisfying. Why not brainstorm on paper (or in the comments below) some pleasurable pre-bedtime activities you can choose from each evening to motivate you to stick to your rule. up for the challenge. I have been getting better at this as I have realized over the last six months, that if I get up an hour before everyone in the house (yes at 6), I actually manage to do more work than say for the two hours I spent in front of the computer from 10pm to midnight. So up for the challenge! 10 Pm cut-off time it is for the week 🙂 (well maybe not tomorrow. Are you coming?). Love that revelation Corrine! Good for you. 10pm sounds like a very sensible cut-off time. Sadly I won’t be able to make the IWB event tomorrow as I have to help my teenager study for two tests AND I have a Master Your To Do List workshop client booked in from 8-9pm. She’s in L.A. so I needed to offer her this appt time. Enjoy! 🙂 Good luck with the challenge!! Great idea Kelly. I’m up for the challenge. I usually pick up my kids from school (they are day pupils at a boarding school) at 9:15pm then often get sucked in to watching rubbish on TV until the wee hours. I’m going to set my alarm to disconnect for 10:30pm. Great post, and very envious of your having heard Arianna Huffington speak – it sounds like a brilliant talk. I’ll be switching off from 9pm-9am and will blog about how it goes next week – good luck everyone!